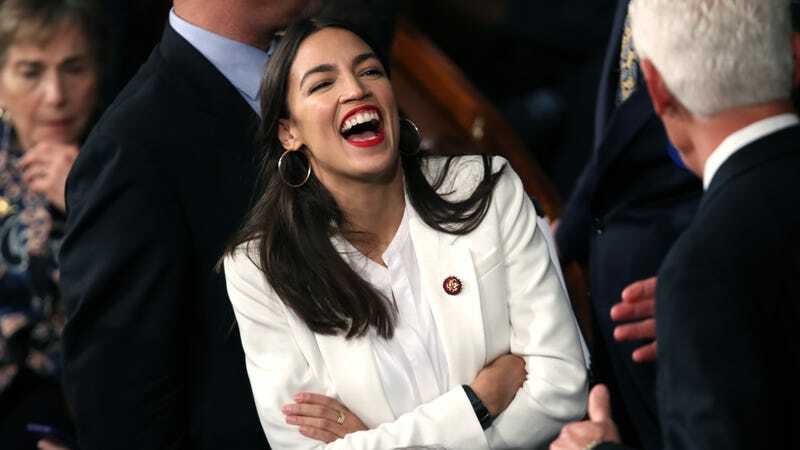 Rep. Alexandria Ocasio-Cortez (D-NY) talks to fellow members of Congress during the first session of the 116th Congress at the U.S. Capitol January 03, 2019 in Washington, DC. When Donald Trump approaches the podium to wheeze through his sad little State of the Union address Tuesday night (when most of us would rather be watching Phylicia Rashad and Susan Kelechi Watson devour scenery on This Is Us), he will likely be greeted with a sea of white. No, it won’t be the hoods of the Ku Klux Klan (though we’re guessing he wishes). It’ll be the legion of congresswomen who stand in opposition to the Fanta Menace’s policies on women’s rights (and women, in general), amongst other problematic policies. As a silent protest, a number of women from both sides of the aisle will be donning white outfits at the behest of the Democratic Women’s Working Group, which proposed the gesture as both a nod to the all-white garb worn by members of the suffrage movement, “as well as to represent the goals of the new congressmen and women who just began their terms in office,” reports Glamour. Of course, this won’t be the first time congressional women have dressed in protest of the man currently in the oval; Democratic women did the same at Trump’s first State of the Union in 2017, as a demonstration of their dissent and collective strength. In 2018, the color was black, in support of the Me Too and Time’s Up movements. With a blue wave flooding the House with Democratic women last November—and a few Republican women joining the fray—this year’s demonstration is set to be even bigger, especially in the wake of the recent government shutdown and announcement of several prominent Democrats entering the 2020 presidential race. But of course, the issue of Trump’s address is likely to be immigration—and he may see at least one familiar face in tonight’s audience in protest of his draconian policies. The Washington Post reports that an undocumented worker who, until recently, was one of many who worked at least two Trump National Golf Clubs in the New York/New Jersey area, will be attending the 2019 State of the Union as a guest of Rep. Bonnie Watson Coleman (D-N.J.). No word if Guatemalan maid-turned-immigration activist Victorina Morales will also wear white, but she is one of several prominent “plus-ones” congresswomen are bringing to tonight’s address; a move modeled after the Time’s Up movement’s guests at the 2018 Golden Globes.